See in Glossary, it is useful to preview the operation of some parts of the machine separately. For this, you can use the Mute / Solo functionality. Muting means a transition will be disabled. Soloed transtions are enabled and with respect to other transitions originating from the same state. 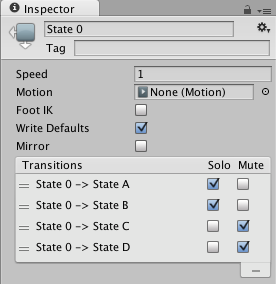 You can set up mute and solo states either from the Transition Inspector, or the State Inspector (recommended), where you’ll have an overview of all the transitions from that state. In the example above, if you are in State 0, only transitions to State A and State B will be available. The basic rule of thumb is that if one Solo is ticked, the rest of the transitions from that state will be muted. If both Solo and Mute are ticked, then Mute takes precedence. The controller graph currently doesn’t always reflect the internal mute states of the engine.